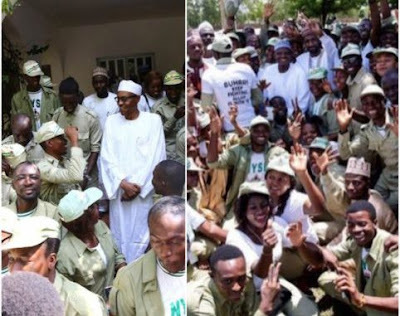 Nigeria’s President, Muhmmadu Buhari, who is currently celebrating Sallah in his hometown, Daura, Kastina State was paid a visit by Corp Members serving in the State. Addressing the corp members on behalf of President Buhari, the Senior Special Assistant to the President on Media and Publicity, Mallam Garba Shehu, charged corps members who visited to uphold the country’s unity, as he also assured them of government’s commitment to the unity of the country. According to the President, the NYSC scheme was the best reconciliatory scheme and would remain relevant, while disclosing that the NYSC scheme had over the years continued to pursue the purpose of integrating the country to newsmen, noting that diversity of cultures remained Nigeria’s greatest strength. Speaking on behalf of the corp members, Nnamdi John, commended the President for granting them audience, while promising that corps members would continue to promote the unity of the country through enlightenment and community development services. The corps members were presented with 10 bags of rice, a cow and N250,000 cash for their Sallah celebration.